This product entry is for Vorshlag camber-caster plates to fit both the BMW E90 3-series and E82 1-series non-M Coupes, Sedans and Convertibles. This camber plate can be used with either OEM Style springs or Coilover springs and virtually any strut type. Please choose the appropriate spring and strut from the option drop-downs below. Does not fit E82 1M or E90/92/93 M3 modes. Please see the E82 1M/E9x M3 OEM Spring Perch product entry here. Please see the E82 1M/E9x M3 Coilover Spring Perch product entry here. 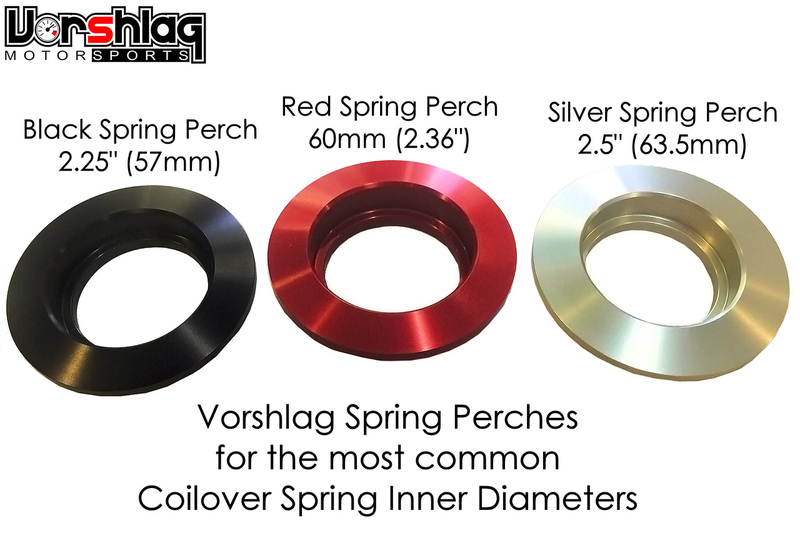 In order to properly use Vorshlag camber plates, you must choose the option below to include Vorshlag upper spring perches that match your strut brand and spring type. 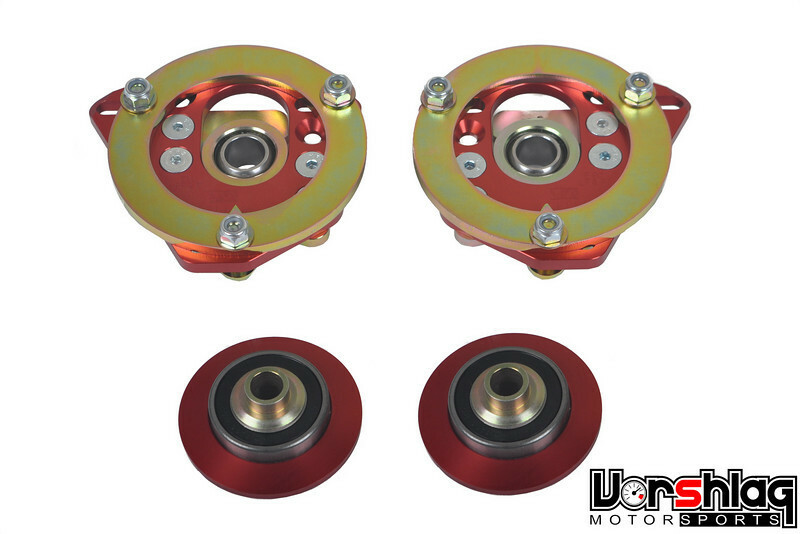 Vorshlag camber/caster plates are designed to be compatible with 2.5”, 2.25" and 60mm “coilover” style springs, OEM (stock) style springs and all strut types. We make numerous variations of this plate and accompanying perches to work with your set-up. The Vorshlag upper perches allow us to add a sealed radial bearing that isolates the spherical bearing in the camber plate from radial turning loads of of the strut shaft during steering inputs. This is part of why our plates last the lifetime of the car! Compatible with 2.5", 2.25" and 60 mm coilover springs, factory springs, OEM Style Lowering springs and all struts. No need to change camber plates when switching from regular springs to coilovers - some companies sell you two totally different camber plates for coilover springs and factory style springs. 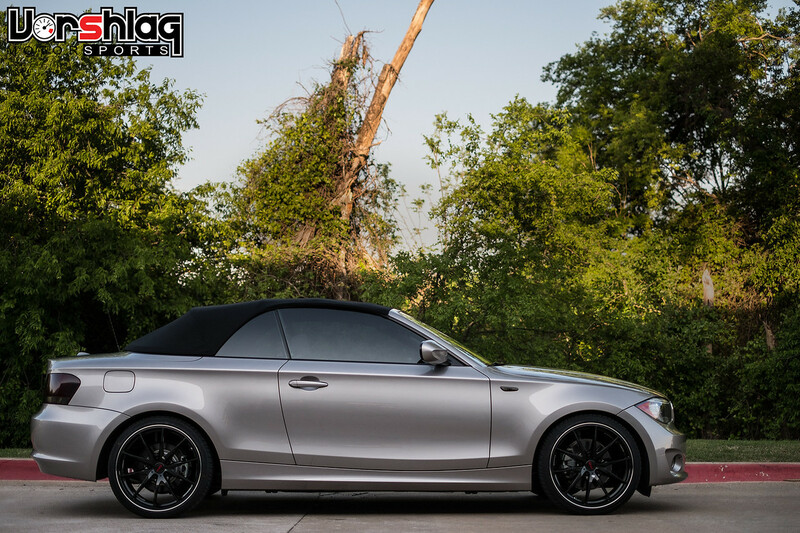 Plates are designed specifically for BMW E82 & E87 (1 series) and E90 or E92 (3 series) chassis (except E90/E92 M3, see separate product entries on our website). Camber is easily adjustable at the track from the engine compartment with simple (metric) hand tools. No need to reach inside the wheel well with a wrench to tighten. The spherical bearing used in the Vorshlag camber plate is the largest used in any BMW camber plate on the market. The result is much better durability and wear characteristics than the undersized bearings used in our competitors' plates. Designed for maximum suspension travel (bump travel). More than an inch more strut travel than some of our competitors' designs. Vorshlag Upper spring perches required. Coilover perches included in the basic price, but OEM style perches are extra (see "Spring Perch" drop down option menu, below). Maximum negative camber setting depends on caster setting, ride height, and is ultimately limited by the strut tower opening on these chassis. The E82/90/92 strut tower hole is more restrictive than previous generation BMWs. Expect to get -2 to -3.5 max camber, depending on ride height. New and improved .25" thick top ring (introduced Dec 2008) for increased clearance between Vorshlag long reach M12x1.5 strut top nut to factory (faux) strut brace. Improved low profile bolt ring for more clearance when used with OEM style perches. Spring Perches: Please pick the spring perch diameter that works with the springs you have. Coilover springs typically come in one of three inner diameters: 2.25", 60mm and 2.5". Ground Control coilovers are supplied with 2.5" dia and TCKline supplied coilovers are 60mm dia springs. KWs coilovers tend to be 60mm but some of these and some Bilstein PSS series coilovers use the OEM upper perch (a tapered spring - see pics below). Note: Most (but not all) Bilstein PSS9/10 "coilover" struts are sold with a unique spring that has 60mm ID at the bottom but uses the factory upper spring perch. This spring is easily identified - turn the steering wheel to full lock then peek inside the front wheel opening - if the spring is small at the bottom and tapers to a larger size at the top it needs the OEM upper spring perch. These struts can easily be converted to a true 60mm ID coilover spring which improves camber adjustment due to the much smaller size of the spring, as well as gives you hundreds of spring rate and length options. Strut Style: Please pick your strut brand and sizes from the drop down below. This helps us build the spring perches to fit your struts with a tight tolerance and no slop - for quiet, reliable use. If you do not know what struts you have please have a reputable BMW shop inspect them, as most mechanics can spot the differences with a quick look. There are also new struts and updates to existing models that come out from time to time. If your strut is not listed, please pick the "Other" option and let us know what brand and model struts you have in the order notes. Note: Koni makes struts for some BMWs with both tapered and square shaft shoulder transitions, so if you have Koni struts please inspect your struts before ordering (or let us know when and where they were purchased, which helps us determine what style to build for). Also see our BMW Spring & Strut Tech Guide for more information.